They got my email address. It wasn’t hard, the guy said I’d get some sort of coupon sent to me, and he asked nice enough, so why not? This is super important, whoever is doing the checkout training, keep it up! Getting this information might be hard to train employees to do but it’s definitely worth it. We recommend offering incentives for every validated email address that’s entered, it’s a great way to get the data you need and a nice pat on the pack for employees. If collection rates are lower than desired, you can offer to email receipts to customers (Apple does this), people love to lose receipts and being able to return something despite that is a great plus for them, as well as a great incentive to get that email address. They promptly emailed me relevant stuff. I bought a very specific battery that only works with certain power tools, they somehow knew this and sent me some very interesting and actually related products. Stuff I didn’t even know existed and worked with my new purchase. Kudos to you Sears for such great targeting. Sadly, what they did right stopped there. What came after the above (great) email was both funny and sad. I mentioned I bought a battery, right? 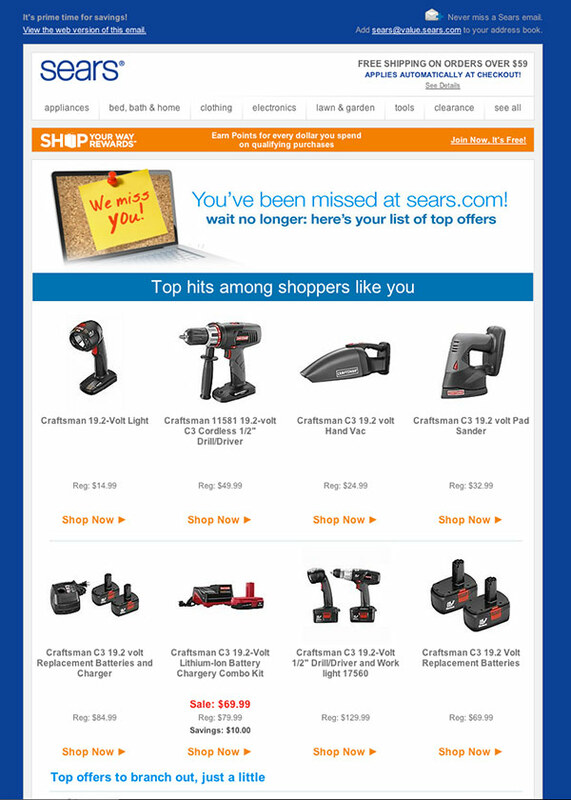 Well, apparently the segmentation robots at Sears thought it’d be a great idea to only ever tell me about the various batteries they had for sale. Double A, Triple A, Nine volt, Energizer, Duracell…all very nice batteries I’m sure, but there does come a point of diminishing returns on segmentation and email targeting. Yes I bought a battery; however, rather than segmenting so tightly in the product category (batteries), I should have been segmented in a much broader categories such as: Male, Age 25-39, Interested in Power Tools, or even Geographic Region. All of this was information they had but failed to used well. They could have slowly branched out into appliances, men’s clothing, gift ideas for my wife, etc. etc. etc. Nope. Just batteries. About the Author: Evan Diaz is the VP of Creative Services for Inbox Group, a super cool email marketing agency based just outside Dallas, Texas. You can follow him on Twitter (@evandiaz).